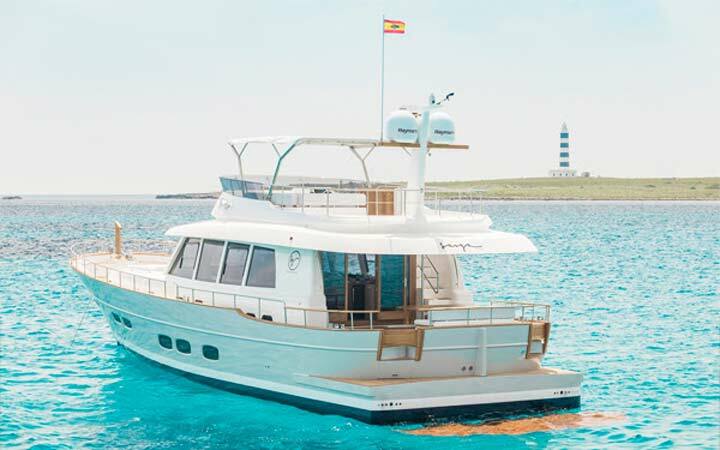 Menorcan boat builder, Sasga Yachts, has launched a new ‘flagship’ model – the Menorquín 68 FB, designed by Barracuda Yacht Design. Barracuda first became involved with Sasga in 2010, since then, choice of model sizes has grown and now comprises the 34, 42, 54 and latest 68 FB (Fly-Bridge version), with Barracuda having retained strong Menorquín family resemblances throughout the entire range. Visual and emotional reminders are drawn from centuries-old Llaüts – traditional, Balearic, multi-chine, double-ended fishing boats, known for good seakeeping ability, with many still being used even today. Optimised for economical cruising in the 10/12 knots region, with higher passage-speeds in the region of 16/24knots easily available, the 68 FB hull is a deep-v, semi-displacement design, allowing passengers a soft, comfortable and compliant ride. In common with the 42 and the 54, the new ‘flagship’ 68 has a Fly-Bridge option, with external, elevated helm position, galley, and large, open living space, with ample seating and an essential fixed-arch bimini. The vertical stem, high freeboard, rounded canoe-stern and generous beam, carried almost the entire length of the hull, has resulted in exceptionally voluminous and eminently useable interior and exterior spaces. Construction of the hull is vacuum infused GRP resin for a stronger, stiffer hull. Knee-high bulwarks, with sturdy hand-rails, shallow height steps, with wide foot treads are examples of the kind of small, but safety orientated touches that make this boat a very sensible environment for the very young and old-age citizens alike. Acting in much the same way as a sun hat does, the accentuated overhang of the roof over the top of the saloon is not just a Menorquín family characteristic, but it offers a good dose of shade and helps keep the saloon as cool as possible. Extending over the expansive aft-deck terrace area as it does, the roof not only lengthens and visually streamlines the side-profile, but it provides the aft-deck with pillar-less overhead protection and uninterrupted views to the rear and sides. Once the 4m dinghy has been removed from the tender platform, there’s an impressive 400kg tender-lift system that doubles as a large and safe swim-platform. While exterior inspiration may have come from boats from the long since passed, this is where any direct comparison with ‘old-fashioned’ tradition ends. Inside the saloon, space has been maximised and is dominated by tall, elegant windows for all-round visibility and plenty of natural incoming light. There’s a calming ambience and relaxed, home-from-home feeling that pervades the living spaces throughout. We think the owner’s choice of subtle light Oak furniture and wall panelling with soft ‘white-wash’ matt varnish finish is superb. The dining table and combined U-shaped seating is to starboard and the inside helm position immediately in-front. 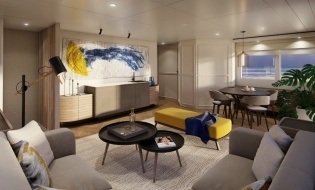 Opposite, on the port side, you’ll find a sociable coffee table area and additional L-shaped seating and waist-high cupboards and audio/TV area. Owners can choose to have the furniture exactly how they want with extra cupboard storage perhaps, a bespoke wine-fridge and cigar humidor or, indeed, any other personal preference required. Accessed via stairs down from the main saloon, the galley is intelligently located next to the main dining table area and aft-terrace patio, for ease of serving and clearing away. This fully-fitted, practical, U-shaped galley has plenty of cupboard and counter-top space and is a genuine showpiece many people would be proud to have in their home. Accommodation is offered as one of two main layout options. The six-person option (plus two crew berths) comprises a most impressive, full-beam master stateroom mid-ships, with double en-suite washrooms with large interconnecting shower. Vanity desk and separate settee / coffee-table area. Plus, twin-berth cabin to starboard and additional, double-berth VIP cabin in the bow section. Option two is an eight-person layout (plus two crew berths) comprising two separate, double-berth VIP cabins mid-ships, a twin-berth cabin to starboard and double-berth master cabin in the bow. Noise and vibration have been reduced to the bare minimum and Barracuda Yacht Design - combined with Sasga Yachts high build quality and obsessive attention to detail - have turned this outwardly traditional design into a supremely comfortable, modern, efficient option with distinctive personality, charm, and great character.